Earl Joseph Smith III (J.R. Smith) was born in Freehold, New Jersey on September 9, 1985. His parents are Ida and Earl Smith, Jr. J.R.'s father played basketball for Monmouth University. J.R was one of four children. He has a sister, Stephanie, and two brothers, Chris and Dimitrius, Chris, two years younger finished his senior year at Louisville in 2012. J.R. attended four different high schools and played basketball at two, Lakewood High School and Saint Benedicts Preparatory School in Newark. His career average 27 points a game in four seasons varsity seasons. As a high school junior J.R. signed a letter of intent to the University of North Carolina. After his senior year, however, he changed his mind and decided to declare himself for the 2004 NBA Draft. J.R. was taken as the 18th overall pick by the New Orleans Hornets. He averaged 10.3 points a game as a rookie and made it to the Rising Stars Slam Dunk Contest, where he faced Dwight Howard and Amar'e Stoudemire. J.R. played one more season in New Orleans. Following the season J.R. was traded to the Chicago Bulls in the summer of 2006. Six days later he was traded to the Denver Nuggets. During the NBA lockout in 2011, J.R. decided to go and play in the Chinese Basketball Association. The rule for NBA players playing in the CBA is they have to play the full season before they are eligible to return to the NBA. J.R played the 32 game season with the Zhejiang Golden Bulls. He averaged 34.4 points per game. When the season in China ended, J.R. found himself right in the middle of Linsanity with the New York Knicks. J.R. was reunited with his former Denver teammate Carmelo Anthony, who is the godfather of his children. 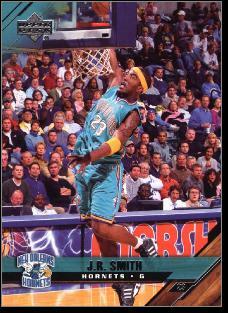 J.R. averaged 12.5 points per game and had a .337 three-point percentage. He helped the Knicks make the playoffs, but unfortunately they lost in the first round to the Miami Heat. J.R. signed a contract extension with the Knicks worth $2.8 million in the summer of 2012. Coming off the bench most of the year, he delivered buzzer-beating victories and 30-point performances to help the Knicks reach 50 wins for the first time in more than a decade. J.R. average 18.1 points per game and was an easy pick for the NBA Sixth Man Award. The following season, he assumed more of a playmaking role, but still averaged 14.5 points per game. In a 2014 loss to the Heat, he set an NBA record by attempting 22 3-pointers. He took 10 in the fourth quarter alone. A highlight of that season was the opportunity to play alongside his younger brother, Chris, who had also played for St. Benedict's Prep. Throughout his career it was often pointed out that J.R. had more success driving on the court then off the court. From April 2005 to January 2006 he racked up 27 points on his license. He had plead guilty to reckless driving in Monmouth County, NJ when he ran a stop sign and was involved in a fatal accident. JR was sentenced to 90 days in Monmouth County Jail but he made a deal to remove 60 days if he did 500 hours of community service. In 2012 he was arrested in Miami for failure to appear in court on a ticket for driving a motor scooter without a license. JR's off-the-court issues did not keep him from becoming a valuable member of the reconstituted Cleveland Cavaliers. He joined the club midway through the 2014-15 season, providing scoring punch and experience. In Game 1 of the Eastern Conference FInals, he came off the bench to score 28 points against the Atlanta Hawks, including a franchise-record eight 3-pointers.The Cavs dropped the NBA Finals to Golden State, as Kyrie Irving and Kevin Love were injured. The Warriors keyed on JR and LeBron James and took the series in six games. It was a very different story in 2016, as the Cavs crushed their playoff opponents on the way to a rematch with Golden State. In the second round, they set a playoff record with 20 3-pointers in Game 2 against the Hawks. JR hit 7 of them. After falling behind 0–2 in the finals. Cleveland won Game 3 with help from JR's 20 points. The Cavs evened the series at 3–3 but their 3-point shooting wasn't there in Game 7. Scoring many of their points in the paint, they kept it close until thelast minute, when Irving canned the winning shot—a 3-pointer over Steph Curry. JR was understandably emotional after the final buzzer. The championship had come on Father's Day, and his dad, Earl, was on hand to congratulate him. JR re-signed with the Cavs after he season and helped them reach the NBA Finals again in 2017. The road to the postseason wasn’t an easy one for him. He fractured his thumb in a December game and missed almost half the season before making it back onto the court. JR shot well from three-point range during the playoffs. During the regular season he cracked the all-time Top 15 three-point scorers in NBA history.